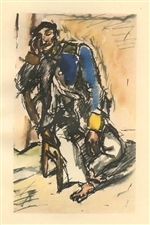 Rene Beeh original lithograph "Der Bettler"
Medium: original lithograph. Printed in Germany in 1921 for the rare Ganymed portfolio of "Das dritte Jahrbuch der Marees Gesellschaft", published in Munich by Marees-Gesellschaft, R. Piper & Co. The lithograph was printed by Franz Hanfstaengl, of Munich. The sheet measures 11 x 8 inches (277 x 200 mm). Not signed. Condition: there is a bit of foxing. Medium: pochoir (after the watercolor). Printed in Germany in 1922 for the rare Ganymed "Das vierte Jahrbuch der Marees Gesellschaft", published in Munich by Marees-Gesellschaft, R. Piper & Co. The image measures 8 x 4 3/4 inches (200 x 123 mm) with good margins. Not signed.